Pa-chow! Zing! Did you hear that? 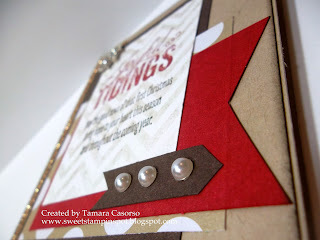 Another week has FLOWN by and it's time for Challenge #010 at As You See It Challenge! I'm having sooo much fun doing these weekly challenges. Sometimes I'm amazed at what I come up with. Like this week. I was having a really hard time and stuck in a rut. I really wanted to use washi tape and I struggled and struggled. Then I just ditched the washi tape and went another direction and I.seriously.love.it! Once I got going, it came together pretty quick! I did have to reference the sketch about a bazillion times, but I'm really pleased with the outcome. I took a ton of pictures so bear with me...(side note, I think it's funny when people write "bare with me". I'm like, um, no, I'm not going to be bare with you...) Get back on track! That little strip holding the pearls? Yep, arrow of death. It was like getting a bad haircut. A little here, a little there. That's too long, not that side looks funny. It started out about 5 inches and now it's only 2.5. Sigh. Frosted Finishes are gorgeous! Typically I would hoard these precious gems but HOARD NO MORE! We used them at my last technique night and this was the last one in the container! Gotta order more! 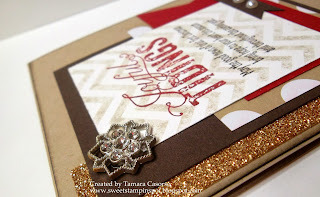 And, before we move on, I have to give a shout out to the Champagne Glitter Paper! That MAKES this card to me. 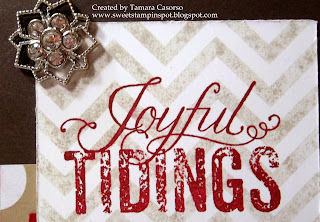 Also digging the Positively Chevron background stamp. 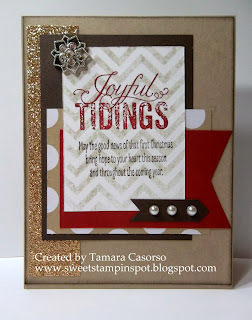 I inked it in Sahara Sand and stamped off once before stamping it on the Whisper White Panel. 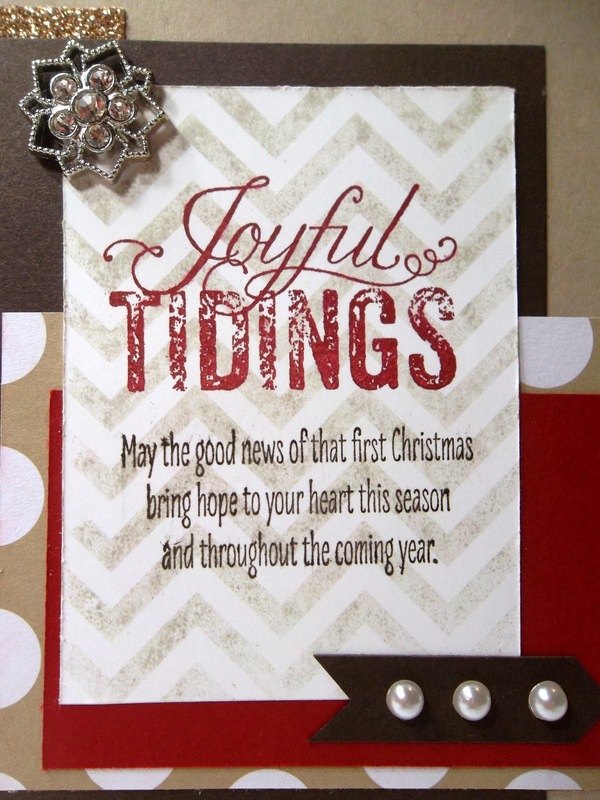 The Joyful Tidings is from Christmas Messages. It's stamped in Cherry Cobbler. There was still a lot of white space on the panel, so I decided to put the normally "inside" greeting on the outside. I lurve it. A lot. 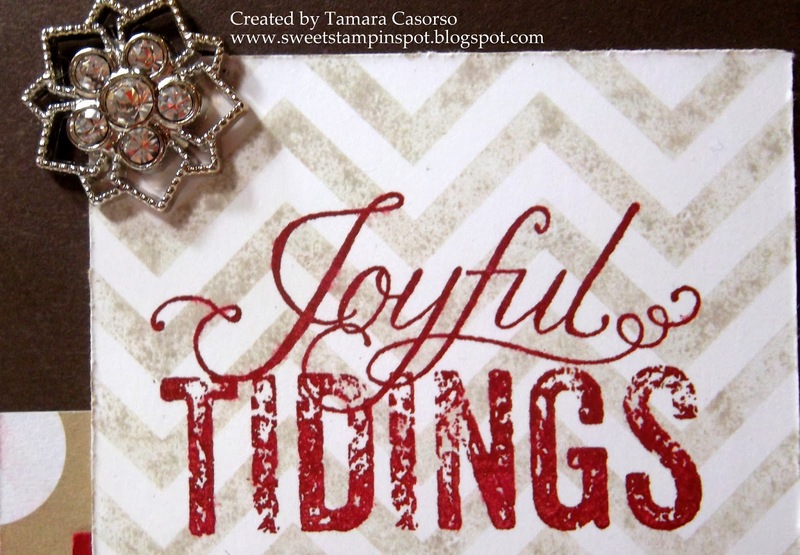 Put it all together and you have one stunning Christmas Card! Here's one last look so you don't get RSI (repetitive scrolling injury). Don't forget to join the fun at As You See It Challenge! 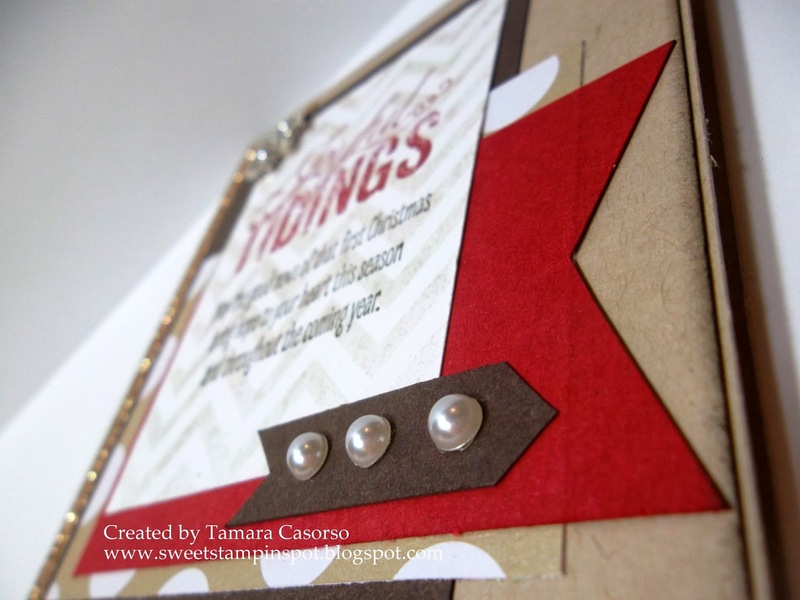 This is an amazing card, Tamara! I really love it, a lot!!! Your card creations have all been amazing lately! I especially love the colours in this one! 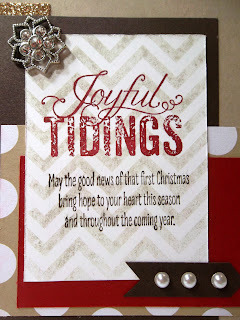 AYSI Challeneg #12 - Joy & Cheer!